Feel the Power of Nature. Photo Slideshow will start after clicking arrows on photo. New to Tierra Chamahua Eco Adventures is a package we are very excited to have the opportunity to offer our guests. Combining our love for the ranch as well as the Sea of Cortez, our “Sea to Sierra” holiday will take you on a diverse and unique journey encompassing adventures in the Sierra Madre, as well as the Sea of Cortez. To begin, you will spend five quality nights at Rancho Los Baños, partaking in those adventures that appeal to you. Whether backcountry horseback riding, box canyon hiking, lake kayaking, fishing, mountain biking, jeep ecotouring or porching, your stay at the ranch will be filled with active adventures, in a setting that is breath-taking, secluded, peaceful and pristine. On the sixth day of your adventure, we will leave the Rancho and head west, in the direction of the famous and beautiful Sea of Cortez [drive time 5-6 hours]. On the way, we will visit the scenic and historic towns of Cumpas, Moctezuma and Ures, all along Mexico Highway 17. Between these towns you will see inspiring landscapes and scenery, discovering a wilderness area that is a real hidden gem. Passing Hermosillo, Sonora’s capital, we will finally head to our beach destination, either San Carlos or Bahia de Kino, Kino Bay, lazy fishing towns that certainly offers the nicest beaches in Sonora. Here, you will discover two towns whitewashed, relaxed and convenient, offering us many activities to chose from. Their beauty overlooking the Sea of Cortez is undeniable, yet they remains unchanged, uncommercialized and charming. Our four night stay at either San Carlos or Kino Bay will allow us the opportunity to visit an estuary mangrove lagoon, with a delicious restaurant and excellent birding opportunities, as well as tours of Alcatraz island just off-shore, with its incredible bird life [not to mention sea lions], and an optional tour of Tiburon island, Mexico’s largest. This island is also a nature preserve. Sea kayaking is also available. If you have never experienced the ocean in a desert environment, it is a beautiful, scenic, exotic and unique opportunity, offering an out of this world experience. With gorgeous white-sand beaches, warm, calm ocean water, no crowds or noise, Bahia de Kino will capture your imagination. For those seeking nothing but sun and beach, your days can also be devoted to reading your favorite book on the beach, relaxing under incredible temperatures and weather, sipping Corona’s or Margarita’s. With ocean water that is warm and pleasant, a dip or two in calm waters will feel incredible. Click here if slideshow does not load. 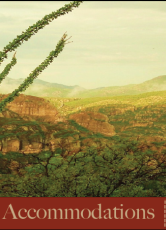 Link will take you to collection of photos that showcase the beauty and essence of the Rancho. If deep-sea fishing is your adventure of choice, we can set up a half or full-day fishing adventure for you as well. Indeed, there is nothing like deep-sea fishing on the magical waters of the Sea of Cortez. For those interested, whale and dolphin watching can also be arranged, depending on the season. The Sea of Cortez is world-famous for its rich marine life. Of course your stay will be in your private, modern, comfortable and exclusive beach home rental, with your own driver and host and cook. With delicious food served from one of the region's best chefs, with beachfront access through your condo or home rental, and the quiet, lazy atmosphere of our fishing villages, you will end your adventure in style. After it is all said and done, we will head back to Tucson [drive time 5 hours], returning you home reenergized, rested and with great memories of your incredible, one-of-a-kind Sea to Sierra tour. Indeed, we think there is nothing else like it on Earth. * Besides your five night stay at the ranch, your Sea of Cortez stay is personalized according to personal tastes and preferences based on distinct adventures available. Rates for this 9 night/10 day adventure: $2,500.00/guest, based on three guests or more in your group. Please contact us for details and further information. or plan your next Adventure? Consultant by phone or email.